Greetings from Panama! We had a wonderful day. The traveling went smoothly. 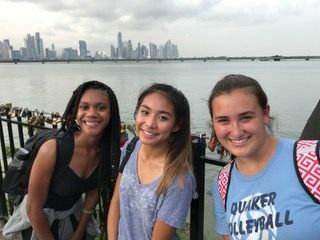 When we arrived in Panama, we were met by our smiling and knowledgeable guides, Juan Carlos, Bernardo and Gary, and we met our other compadres from Alexandria Country Day School. We wasted no time, and went on a really interesting walk through the old colonial part of the city. On the walk we were regaled, mostly in Spanish, about the history of Panama. We wound up at a small traditional Panamanian restaurant where were served 5 courses of delicious food: salad, Spanish tortilla, vegetable rice, and protein of choice, and then dessert (tres leches). It was a great meal. When we got to our hotel, we played a memory game—in Spanish—which centered on our favorite and least favorite parts of the day (our “rose and thorn”). Everyone seemed to really like the walk around the old town and were happy to get off the plane! We are in good spirits, tired, and ready for a busy day tomorrow (service in the morning, a hike in the afternoon, and salsa dancing in the evening). Day two was tiring, but very rewarding. First we woke up at 6:30 because we had to leave the hotel by 7:30. I'll be the first to admit that I am not a morning person, so I was the last one in my room to get out of bed, but everyone made it downstairs to eat the delicious food provided by the hotel. After eating we hopped on the bus and went to a unique local community soup kitchen to help with the organization CocyDon. This organization collects, cooks, and distributes food to less fortunate people all over the city. The group was split up and given all sorts of tasks, I started out by wrapping utensils with napkins and quickly realized that Ryan McWalter was the quickest and everyone else could only hope to keep up. Other tasks included cleaning pots, packing lunches, and writing positive messages in Spanish on the food containers. Because of this I now know " Eres especial, nunca lo olvides" or "You are special, never forget it" by heart. Once we finished we took food and clothes, that were donated as well, and gave them out to the community in Paso Blanco, an impoverished town in the outskirts of Panama City. Seeing the smiles on the faces of the children when they received food and clothes is something I will not forget, and this opportunity caused me to appreciate just how lucky I am to be community that values stewardship and helping people that are less fortunate. After experiencing a different side of Panama, we ate at a local establishment that showed off the true Panamanian cuisine, Dominos Pizza. After, eating our fair share of pizza we returned to the city to learn the Salsa. The instructor was very energetic and I danced until my breathing was heavy and my legs were tired. It was cool to see everyone having fun dancing(and falling). Finally, we ended with a dinner right across the street from the hotel, where we enjoyed empanadas, ceviche, plantains, and more. After such a busy day, I am thrilled that tomorrow will be a little more calm. 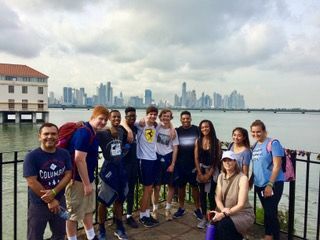 We will be able to see many sides of Panama as we hike up Cerro Ancón, visit both the new and old districts of Panama city, and eat with a local Panamanian family for dinner. It's been a great trip so far and I look forward to learning and experiencing as much as I can here in Panama! Today was our calm before the storm. Even though we did less than the previous day, we all had lots of fun. We started out today with a short but tiring hike up to the tallest point in Panama City. 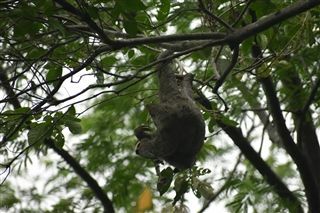 We saw a toucan, a sloth and a beautiful view of the two city sections: the old and the new. The view from the top was totally worth the hike by the way. We then hopped back on to the bus and drove across the Bridge of the Americas to get a better view of the canal at low tide which was very impressive accounting for the lack of water. 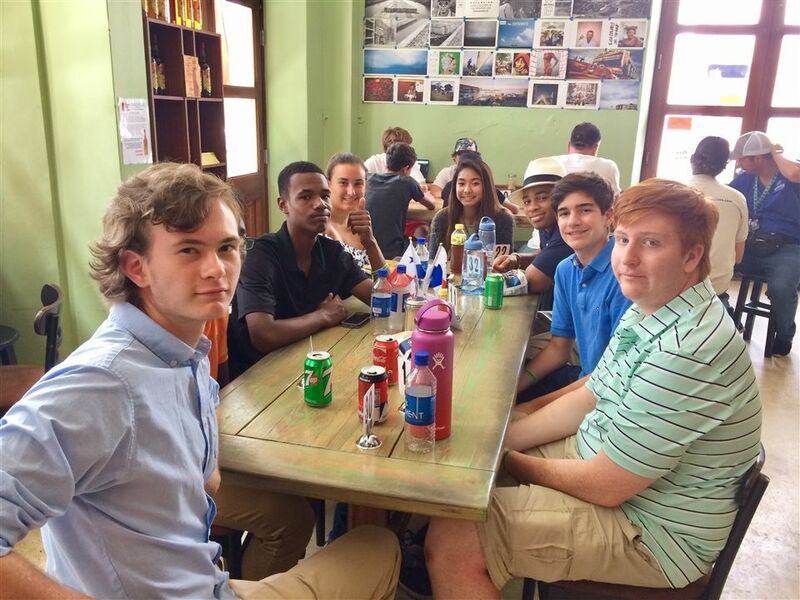 It was lunch time and we headed to the local fish market for some of the freshest fish you can find in Panama City. I was with the guys, and I ended up getting a couple of cups made out of plantains (basically a banana but more versatile in cooking) filled with fresh shrimp, clams, oyster, and more random seafood. I don't think I've ever had any fish that fresh. It was raining once we finished, but nobody seemed to care because of the match between Brazil and Switzerland everyone sat in one of the military outposts near the dock along with a few locals and watched the game. We headed back to the hotel and watched the rest from our rooms; it ended in a tie (un empate). Dinner was at a local family's home where we made amazing chicken along with a salad and some fried plantains. We had a few conversations with them along the cooking process. They had a quite interesting dessert, a plant similar to the mango with salt and vinegar. I was told it was gonna be crunchy. I ended up trying to take a big bite out of the fruit and I couldn't get all the way through (I never did). Lastly, we walked from the hotel to a small popsicle shop and got chocolate dipped popsicles. The days are always getting better and everyone is having a great time. Today was the busiest we have had since arriving in Panama. We started off the day with a ride up the Río Gatú in a dug out canoe with some indigenous Emberá guides. We then arrived at the Emberá village where we were greeted by a traditional dance/song performed by the Emberá locals. We were then given a quick but informative talk by one of the locals about the different traditions and cultural aspects of the Emberá. A village elder then proceeded to guide us around the village while showing use different plants ranging from pineapples to diarrhea leaves. At around 11 we were invited into one of the huts to watch the Belgium Panama world cup game, which unfortunately ended in a 3-0 win for Belgium. The game ended and we were greeted by three local dances performed by the Emberá, and in the last dance they invited us to join them. 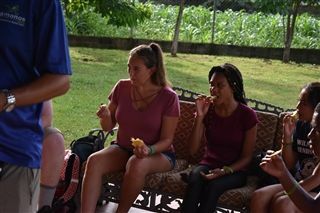 After dancing we were famished and were sated by fresh fish and fried plantains served in banana leaves. Unfortunately, during our lunch the weather was not in our favor, for is started to rain. This meant that we could not complete the service portion of the trip, but it was still a great time and we will make up the service elsewhere! We departed the village after buying some handcrafts from the locals and made in Colón. We visited the nearly built locks on the Caribbean side of the country called Aguas Claras. These locks were the biggest infrastructure project ever undertaken by Panama and they allowed for all new kinds of boats to utilize the convenience of the canal. 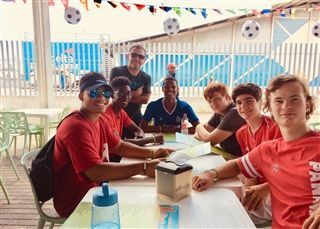 After an informative video about the new locks, we stopped for some delicious empanadas before heading to the Panama Canal Railway where we would board a train to take us back to Panama City. This railroad took us right along the canal and we were able to see many ships making the voyage across. We got back to the hotel around 7pm and headed out to the famous burger joint Esa Flaca Rica, where we enjoyed great burgers and fries. After the burgers everyone was ready to get to sleep and prepare for the early wake up tomorrow where we will get to paint a school on Kuna Yala community island and also enjoy the beach. Today started off in a bit of a rush. 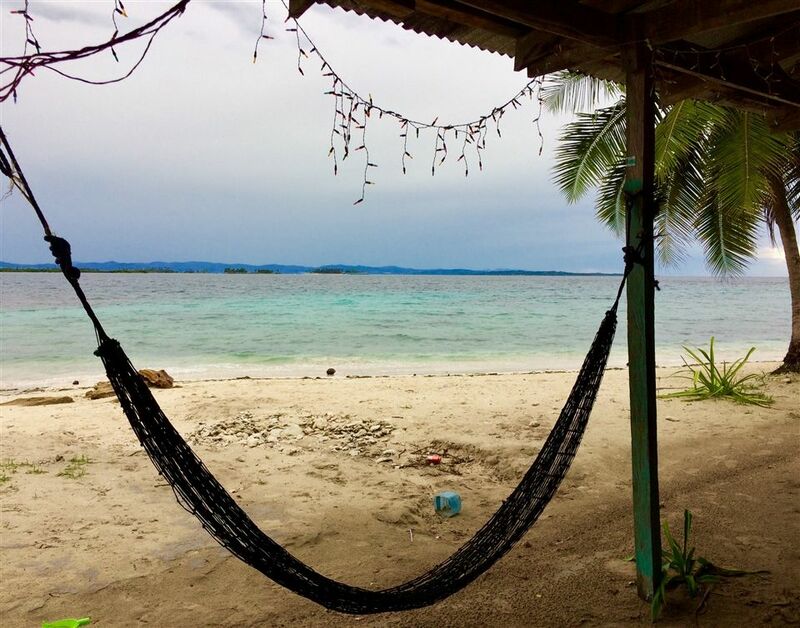 The wake up call was at 4:45am because this morning we had to travel around two hours in SUV's to a dock near the San Blas Islands. From the dock we rode a boat to the Kuna Yala community island where we learned a little bit about the history and culture about the people that live there. After we finished walking around that island we went to another island to paint some school classrooms and help move furniture around. Not only was the painting fun, but when we got a chance, we played soccer with some of the children (who were better than some of us) and our tour guides. When we finished up painting the classrooms, we took a very rainy boat ride to the island that we are sleeping on tonight. On this island we enjoyed time on the beach by swimming, playing soccer, and volleyball. It got dark soon so we all split into our cabins. It was an interesting night because as we were winding down we realized that there was a small bird in our cabin but it didn’t come down and affect us in any way. This island was far from the type of lodging we've been having in the city, but the cabanas were a good change. Today we woke up in our cabanas around 7:45am and ate pancakes with eggs for breakfast. Next we took a boat to an island paradise where we swam, snorkeled, played water games, and ate snacks and other refreshments for close to 3 hours. We then took the boat to a sand bar which they called a pool due to the fact that the water was about two feet deep and because it was such a large sand bar in the middle of the ocean. There we swam and picked up sea stars, sand dollars, and other shells off of the ocean floor. Then we ate lunch back at our island, which was exclusively fish. Afterwards, we took a boat back to the dock and took the SUVs back to the hotel which took roughly 4 hours total-a long travel day from the San Blas Islands to Panama City. We then ate dinner at the Hotel Ramada after a briefing for Bernardo about what we will be doing Thursday. Finally, we showered and now we are turning in for the night. We are looking forward to seeing the presidential palace tomorrow even though the president will not be there. Today started off at a normal wakeup call at 7. Breakfast consisted of eggs, bacon, chicken, and fruit. 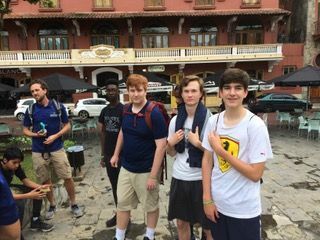 At 8 we checked out of the hotel and headed for Casco Antiguo. 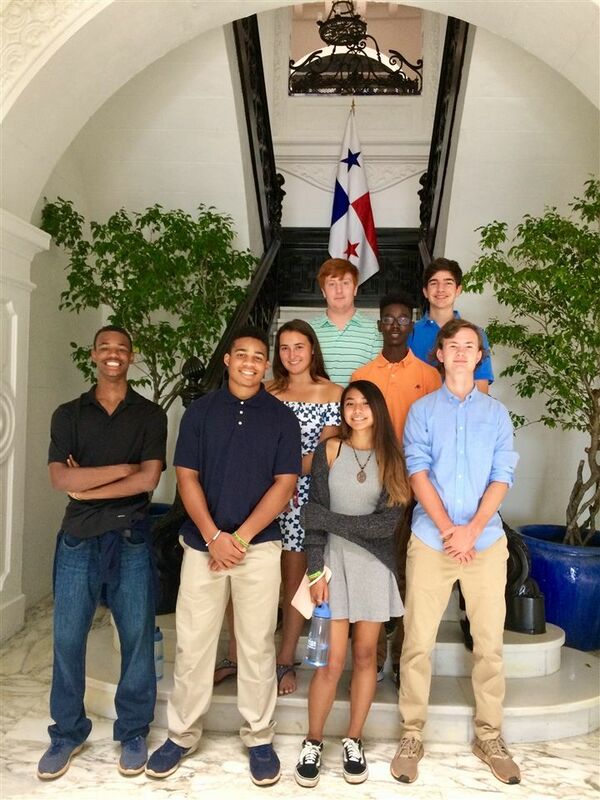 In Casco Antiguo, we took a tour of the Presidential Palace. The palace was amazing even though it was 340 years old. While in the palace, we saw the biggest mola in Panama. Mola is a native artwork that is made of cloth. After the tour of the palace, we walked to the plaza and shopped in the local stores. Also, the other school that were with us during the trip left and made their way back home. After lunch, we departed for Chitré which was about a 3 hour drive. About midway through the trip we stopped at a local farmers' market and tried to bargain with the locals to buy fruits. We arrived at the hotel at around 5:30. We left again at 6:45 to explore Chitré. During the trip we saw the biggest church in Panama. 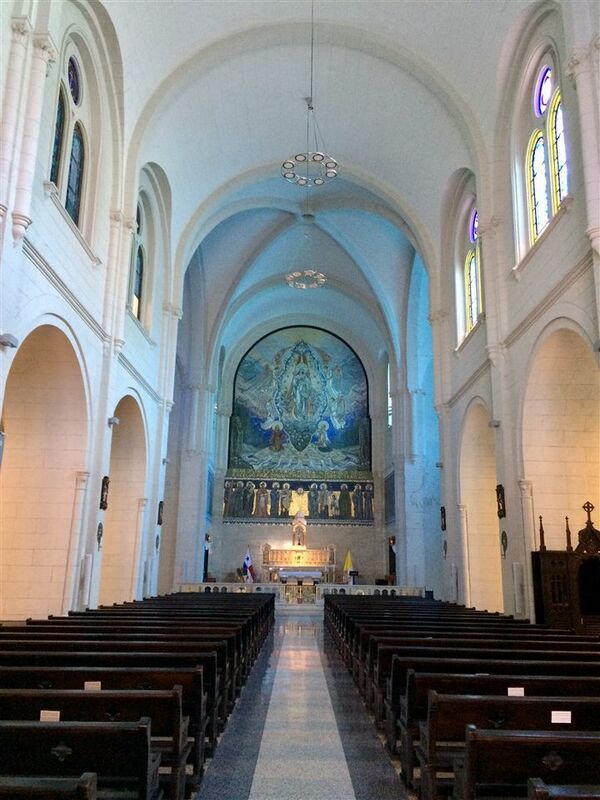 It was one of the most beautiful churches I've ever seen. It reminded me of a European church. After we walked around the town we headed for dinner. Dinner was interesting because the NBA draft was on at the restaurant. We were debating which player would fit each team, but we didn't notice that dinner hadn't come yet. Shortly after we realized that, dinner came and it was worth the wait. After dinner we came back to the hotel and showered, then went to bed. We are hoping to make a lasting impact on the kids that we will see tomorrow at the local school in Chitré. Today we woke up at the normal time, 7am. We got dressed and enjoyed our breakfast at 7:30. Then we hopped on the bus for an extremely short bus ride to a local school called La Escuela Primaria de John F. Kennedy. The ages ranged from kindergarten to 8th grade. We started off by splitting into 3 groups and we toured the school. Our tour ended when we arrived in the middle of the school where a school fundraiser was occurring. They were selling food and the students could pay to play games relating to soccer. All of us were included in the huge soccer game going on, most of the time we were the goalies but sometimes we played on the field with the students. After that, we had free time to make connections with the students and really use our Spanish. 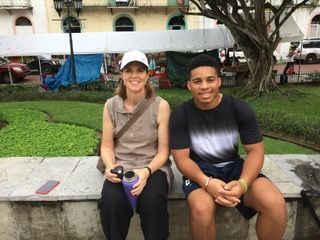 The most important part of this service trip was to establish people to people connections with the kids using the Spanish we have learned in school and just on this trip! As a group we all embraced the adventure and we went our separate ways to make connections. Most of the boys played and talked soccer with all of the students and the rest of us played games that the students taught us. My favorite game was called línea retorcida which means twisted line. It is hard to explain but basically you make a human chain and the line has to pass under everyone's arm and the first person to break loses! It was a lot of fun and brought a lot of smiles to the kids faces and to mine! We also played the normal games like hide and seek and tag! After visiting the school we went back to the hotel where we ate lunch by the pool! After our filling lunch of chicken and rice our other tour guide named Samuel showed us the real culture of Chitré. We visited a town called Arenas which means sand. While we were there we learned that this town is the town of the handcrafts and is especially known for 4 things, pottery, bread, drums and masks. We first visited a man known for his drum making. We learned that the only machine he uses is a chainsaw everything else is by hand. We also learned it takes him 2 days to make a drum and in 20 years he has made over 2,000 drums. Then we hopped back on the bus and headed back toward the hotel to meet a clay maker named José we learned how he makes his clay and we saw his workshop with his family who also works with him. Some of us even got to try making the pots! It was very hard, you had to do everything by hand and feet! Mr. José makes about 120 good clay pots everyday and he sells them for about 25-30 dollars! The last handcraft we learned about was las mascaras (masks), this artist was also named José, has been making Sucio Diablos (dirty devil) masks for more than 20 years. He could not give us an exact number of how many masks he makes per year because it depends on the season, if it is dry and sunny they can make a lot but in the wet season they can not make as many. We then finished the day with some relaxing pool time and a nice dinner at a local restaurant. The most important lesson we learned today was how a simple life can be the best life. We live in a world that is so fast because of technology and the internet that we lose sight of the valuable things right in front of us. It is our ability to use our hands to create the most authentic crafts the world can have! Today was definitely fun and relaxing. We left the Chitré hotel at 8:30am and travelled for about 2 hours by bus to the coast of the peninsula that Chitré lies on. We then took small boats to Isla Iguana! Once we arrived at the beach, we all put down our personal bags and picked up black trash bags. We walked down the beach and picked up litter such as bits of plastic and aluminum cans. There were also other groups of people helping as well. Samuel, one of our tour guides, made sure that we each conversed with at least one of them there in Spanish. After cleaning the beach, we spent a few hours relaxing, swimming, and eating fresh fruit that we bought at local stands a couple days ago. We also saw the iguanas! They are bigger than I thought they were! There were also so many hermit crabs crawling around in all directions. At around 2:00pm, we took the boats back to the coast and drove back to the Chitré Hotel. For dinner, we went to a local pizza shop instead of going to a chain restaurant such as Domino’s, so that we can support the local stores here in Chitré. Today was sort of a resting day compared to our busy days in the past week. Personally, it will definitely feel bittersweet when we leave to head home on Monday! I feel a little bittersweet because today is our last day but it was very eventful. It was an early morning for some because today there was another Panamá game at 7 am. Most us us got up early to watch but I on the other hand slept until 8:30 and woke up to hear them score one goal against England. After the game, we all got on the bus and went to a park to paint a park ranger's house that was gifted to him by the government. He originally lived in a house that was made of mud and straw which is a traditional house in Chitré. The house was gifted to him by the government because he could not afford to build a nicer one and it is the government's mission to build 200,000 homes for people in need. 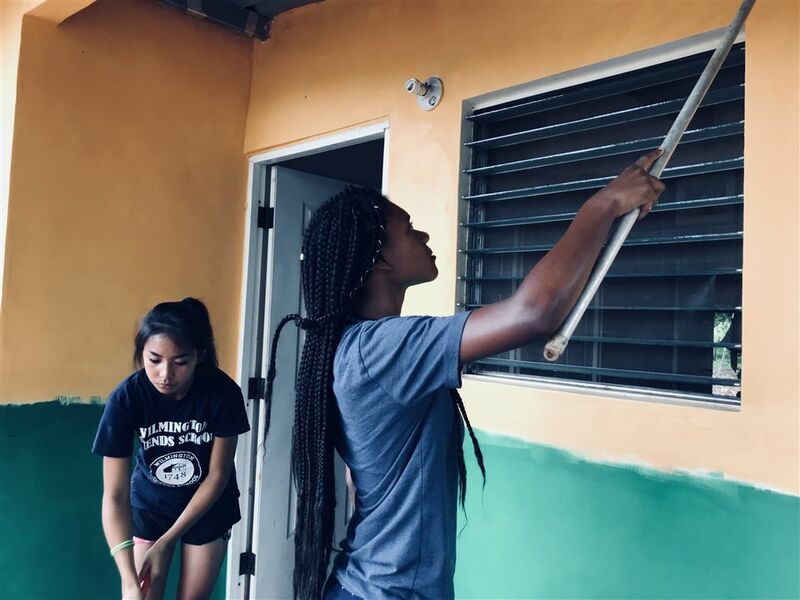 So we painted his house orange and green with a white stripe in the front and by the end I felt happy because we did such a good job and it felt really rewarding to help someone else out even in the littlest way. While we were waiting for the paint to dry so we could retouch, we went on a hike in the park and saw how the ground had been eroded by water that was there years ago. There were big mounds of dirt that had been carved out by the water and all of us climbed up to the top and reenacted the scene from The Lion King where Simba is raised at the cliff. After walking around a bit and talking about how the native people of Panamá created pottery for jewelry and later water cups and bowls we went back to the house and finished up painting. After we went to lunch at a local restaurant and then went to an Artisans house to see how she makes a traditional Panamanian dress called the Pollera. We learned that they take two years to make and can cost up to $100,000 since it takes so many people to make and the patterns that they use can be very difficult. If someone copies another persons pattern then the police can be called because they can only be one of a kind, so the patterns can be the same but the colors have to change. After that, we went into town to see one of the festivals that was going on. At the festival we saw men and women painted in black with masks on to scare the little kids and they honestly scared me as well. The festival also consisted of people riding around the streets in their best horses that only moved their legs when they walked. We stayed there for about 30 minutes and then went back to the hotel for our farewell dinner where a local group danced for us and they brought us up to dance with them. The dinner was very good and Alexa, Ava and I sat with Gary and talked to him in Spanish the whole time about our lives and things that we liked. I'm quite sad that this is our last night here because I've been having so much fun here and I've made so many new friends, not just the people that went on the trip but also the people that we've met while we've been here and I can honestly say that I'm going to miss it so much here but I'm ready to go home and hug my mom because I miss her a lot (don't tell her I said that). But in all seriousness, I'm so grateful for everyone that made this trip happen because I will remember it and the people I met here forever, it was such a great experience that I'm glad I went on before I leave Friends for college.